diced tomatoes (tomatoes, tomato juice, citric acid, calcium chloride), canola oil, onions, garlic, distilled white vinegar, salt, basil, spice. 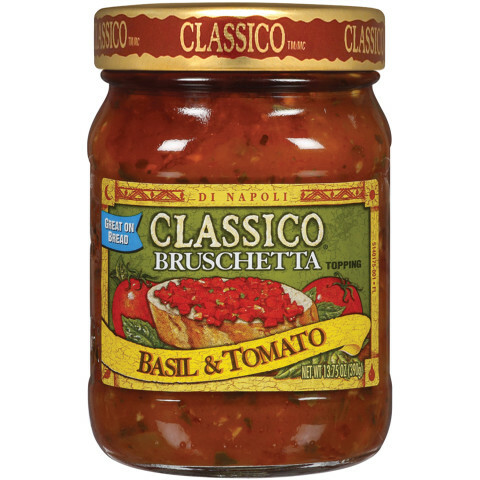 Bruschetta is made by grilling hearty bread over coals, then adding sliced fresh tomatoes and herbs on top….use Classico® Bruschetta topping to recreate this authentic appetizer of Naples. Love, love, love this product! It's our Sunday afternoon treat. 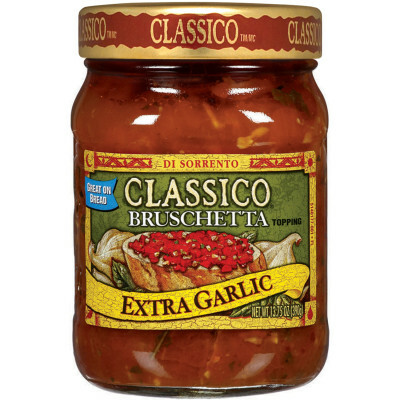 I keep the bruschetta warm on the stove top and people come and go eating a bite here and there on a crispy, buttery grilled bread slice. Can't find it anywhere now....how do I order some?